Babaji left his body on Tuesday September 25, at 10:32 am. His passing was peaceful, and he received loving attention and care throughout the final stages of his life. Gatherings and observances took place here at Salt Spring Centre of Yoga to celebrate his life and mark his passing. 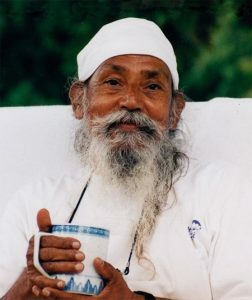 Babaji has inspired and supported so many of us, and his passing is invitation for all of us to reflect upon his example, to grieve the loss of his physical presence, and to give thanks for the joy and wisdom he has brought to our lives. 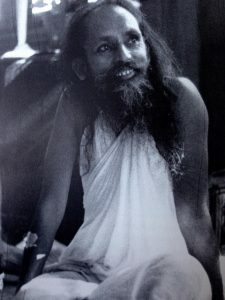 Both the Salt Spring Centre of Yoga and out sister center, the Mount Madonna Center in Santa Cruz, CA, honoured Babaji by performing Tarpaṇam and Śhrāddha for 13 days after his transition. Tarpaṇam and Śhrāddha are rituals from traditional Vedic culture that Babaji has instructed to be done at the time of his passing. They involve offerings that are made to help bring peace to the departed and encourage their liberation. They also serve to mark the departed’s transition from being a physical presence in our lives, to being something more subtle that lives on in our hearts.